NTA NEET admit card 2019 will be made available to registered candidates from 15th April 2019. All the candidates who are going to appear for the test can download their hall tickets from the official website. NEET 2019 will be conducted in single stage across the country in offline mode. All the candidates who are waiting ntaneet.nic.in admit card can get it online by using the login details. They must retain the NTA NEET 2019 admit card till the end of admission process. Latest NEET admit card released. Candidate have to login to view their hall ticket and then download. NOTE: Check all entries carefully, any found error immediately contact the NTA authority for correction. 2 How to download NEET UG Admit card 2019? 2.1 What if candidates forget the NEET password? Exam will be start at the exact time as mentioned above and also on the admit card. NEET admit card will be made available for printed to candidates from April 15 onwards. Admit card will be issued only to the registered candidates who have successfully submitted the application form. Candidates have to print NEET hall ticket from the official website or NTA or from the link shared on this page as no printed copy of the admit card will be dispatched individually to candidates through post. However, at the time of downloading the admit card, a copy of the same will be send to the candidates on their registered email. Candidates should keep the emailed copy safe till the completion of admission and should produce it wherever required. Information about exam date, candidate’s identity, exam time, test centre will be indicated on the hall ticket and no request for change in exam date, time and exam venue will be entertained under any circumstance. Candidates should read all the instructions printed on the admit card and official notification carefully before the exam. They must follow all the instructions given on admit card and at the exam hall. Candidates failing to comply with the guidelines and instructions shall be disqualified and their candidature will be cancelled. All the examinees have to bring the admit card to the exam hall. Candidates not possessing valid admit along with other required documents shall not be permitted to write the exam. Candidates should show the admit card to the invigilator on demand at the exam centre. Before leaving for the exam, examinees should ensure that they have admit card with them. They must also download the admit card well before the exam date. They should not wait for last date to print it as various issues may arise at the time of downloading admit on last moment. Details printed on admit card should be clearly visible. Any alteration or modification in particulars will not be entertained. The very first step is to visit the official website of NTA or NEET 2019 (mentioned above). Candidates can also visit the link shared on this page. On the homepage of the portal, candidates are required to click on “NEET 2019” admit card link. Clicking on the relevant link, admit card login page will be displayed. Candidates have to enter the login credentials in the fields provided. Click on the “Submit” button. They can refer their application forms for application number and password. Candidates will see the admit card on their screens. Lastly, candidates have to download the and print the admit card PDF. Take multiple printouts and retain the same till the completion of admission procedure. What if candidates forget the NEET password? Open the admit card login page as explained above. Select the reset option (through OTP or security question). Provide all the required details for authentication and click on submit button. As per the option selected an OTP will be sent to the registered mobile no./email or security question will asked. Follow the further instructions and reset a new password. From the point of view of an exam, admit card is very essential document to be brought to the examination centre. Admit card allow examinees to entre to exam centre and write the exam. Admit card is important at time of exam as it indicate information about the identity of examinee and information about the exam such candidate’s name, exam schedule, test center etc. Check below the format of the NEET admit card for UG candidates by CBSE, however from this year NTA will released the hall ticket. Candidates should verify all the details printed on the admit card before appear for the exam. Any discrepancy or alteration in the details of hall ticket should be brought to the notice of the conducting authority before the date of exam. A printed copy of the NEET 2019 admit card downloaded from official website of NTA. 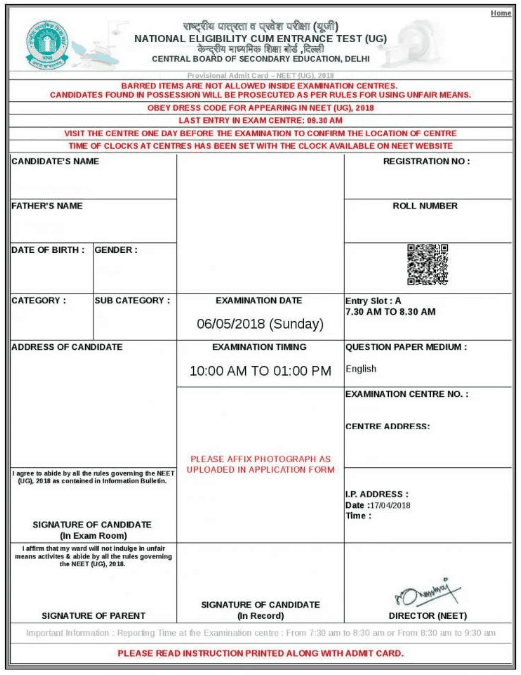 One passport size photograph (same as uploaded in online application form) to be affixed on attendance sheet at the exam hall in the presence of Invigilator. An authorized photo identity proof in original that should be valid and non-expired. They can bring any of the following ID proofs- Aadhaar Card (with photograph)/ Voter ID/ PAN card/ Driving License/ Passport/ /Ration Card/any other. PWD certificate issued by the competent authority (if candidate claims relaxation under PWD category). Registered applicants will be able to print NEET 2019 admit card from 15th April from the official website of NAT. No, admit card will be send through post to candidates. Fabrication or modification of details in admit card will be considered as malpractices, and candidates with such admit cards shall be disqualified. In case candidates have lost or misplace the printed copy of the admit card they can retrieve it from the PDF emailed to them. If you have any question regarding the NEET UG admit card 2019, then you can ask us below, our response team with help you with all the query ASAP. We have tried to provide all the information, however if we miss anything or you want us to add more info, then you can also suggest it in the discussion section below. NEET admit card for undergraduate candidate can be download from the direct provided here. Keep checking this page for latest update on NEET. My address mentioned in the admit card is found incorrect and how to rectify to avoid future complications. My address mentioned in the admit card is found incorrect and how to ‘rectify to avoid future complication.? In the official website, I am not finding anything particular to download the admit card. sir I have entered the wrong date of birth in my application form. However I got my admit card.Is there any way I can get it corrected at the time of counselling? Can I submit off line fee for neet examination .if yes what is the last date? sir I have entered the wrong date of birth in my application form. I got my admit card.Is there any way I can appear for the exam and get it corrected at the time of counselling? How to correct Center code Center Address Mismatch? Even after downloading neet admit card , but replica ( same copy of admit card ) is not sent to my registered email i.d. When trying to download NEET 2019, it says invalid application number even though the number is as per the confirmation page while submitting NEET application.Now how i will get my admit card? In my admit card examination date is written 15/4/19 how can it be corrected?? No need to correct it. Just go to your examination center on the official exam date. Is any problem in future please advise. I fill permanent address in neet form but in my aadhar card print address is present so pl. about this case what i can do pl.reply me. My adress in the admit card is mentioned incorrect and how to rectify to avoid further complication? Try in other browsers or contact NTA. Sir, I have entered the wrong date of birth in my application form. Is there any way I can appear for the exam and get it corrected at the time of counselling? Sir As Per Admit Card my exam centre is in Delhi.I am resident of J & K state and Delhi is 800Kms from my residence.I can’t reach there .What Should I do ? You can’t change it now. When trying to download NEET 2019, it says invalid application number even though the number is as per the confirmation page while submitting NEET application. Is other students also facing similar issues ? There’s a date error in my NEET admit card. Date of exam is printed as 15/04/2019.what type of mistake is this.would we get the date corrected. why are we unable to enter the complete appliction number???? Plz help me . I could not download my admit card. Application no and registration no are same?? I have entered the wrong date of birth in my application form. However I downloaded the admit card.Is there any way I can get it corrected at the time of counselling? it shows me that my application number is invalid then what should i do? How i will get a admit card for NEET entrance exam please help me????? Released???? Please update the link already!!!! I entered wrong DOB can I able to give exam plz tell me what I do?? Please help me. I could not download my admit card. I have forgotten my password. .. Choose a OTP and entry.. I am not found a admit card link in nta website,plz guide me..
No link to download my admit card. When will you release? How could I download my admit card? When will you update NEET Admit card? sir; I have tried several times for downloading my admit card. But the link is not opened.Quick action is requested. WILL YOU PLS NOTIFY ME WHEN THE ADMIT CARD HAS BEEN UPDATED? where can find the download link???? We will update it soon. Please keep checking this page. Because it’s not announced yet. Please wait, we will update it here soon. sir,would u sent our admit cards to our email. Till this moment, I could not see any information about the download of NEET(UG)-2019 exam. Kindly inform at time, it would be made available in that website. Thanks. could you please tell me time when admit card download link will be available on 15 April 2019.
it shows me that my application number is invalid.then what should I do??? How i get my admit card for NEET Exam 2019.
m unable to download my neet 2019 admit card……the option to download the admit card is no showing….might be due to wrong way searching…..
Admit card is not available yet, please wait we will update downloading link here soon.